Although there is a growing awareness for the need to take a multi-dimensional approach to the measurement of poverty, most of the research on poverty in rich countries still relies mainly on a traditional income- or expenditures-based approach. This is also the case in Israel where only a few studies have taken a look at other aspects of poverty such as social exclusion. 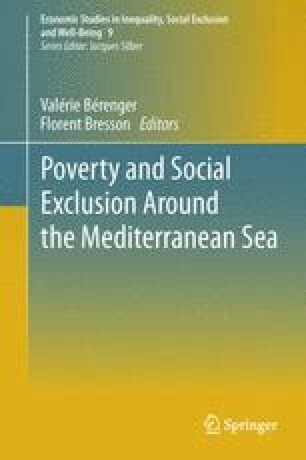 The goal of this chapter is to measure the extent of social exclusion in Israel and compare the results obtained with those derived from a traditional income-based approach to poverty measurement. Also, an analysis of risk factors for social exclusion in Israel is presented. The empirical analysis is based on the first round of the European Social Survey- 2002, a database which provides several indicators of social exclusion. These indicators are aggregated into a single score, which is a weighted average of the various elementary indicators. The measure of social exclusion of the individuals in the survey is then compared with their income data from the survey, and linked to various factors assumed to have an impact on income poverty and social exclusion. The results, as might have been expected, do not show a strong correlation between income poverty and social exclusion. Still, known risk factors for poverty such as a low level of education, young age, poor health, cultural and religious sectors, and female gender have a strong impact on social exclusion. A cluster analysis reveals the existence of three subgroups in Israel which could be labeled as “rich”, “middle class”, and “poor”. While there is a significant income gap between the “rich” and the other two clusters, when looking at social exclusion the main gap is between the “poor” and the other two clusters. These findings seem to confirm that social exclusion in Israel is a distinct phenomenon that deserves to be measured and addressed in addition to traditional poverty. This Study is a part of a Dissertation research project supervised by Prof. J. Silber and Dr. M. Monnickendam, Bar-Ilan University. Abu-Bader, S., & Gottlieb, D. (2009). Poverty, education and employment in the Arab-Bedouin society: A comparative view. Retrieved December 10, 2010 from http://www.btl.gov.il/Publications/research/Documents/mechkar_98.pdf. Bank of Israel. (2009). Welfare policy issues, bank of Israel annual report- 2008. Retrieved October 5, 2010 from http://www.bankisrael.gov.il/deptdata/mehkar/doch08/eng/pe_8.pdf (Hebrew). B.I. and Lucille Cohen Institute for Public Opinion Studies- ESS. (2005). Retrieved November 23, 2006 from http://www.bicohen.tau.ac.il/ (Hebrew). Bradshaw, J., Levitas, R., & Finch, N. (2000). Lone parents, poverty and social exclusion. Poverty and social exclusion survey of Britain. Retrieved June 1, 2006 from http://www.bris.ac.uk/poverty/pse/99PSE-WP11.pdf. Central Bureau of Statistics. (2009). Society in Israel- report no. 2 Retrieved October 1, 2010 from http://www.cbs.gov.il/publications09/rep_02/pdf/h_print.pdf (Hebrew). Dahan, M., Achdut, L., Blasha, S., Ben-Shalom, Y., Bar Siman Tov, M., De-Shalitt, A., et al. (2006). Why is poverty widespread in Israel. Paper presented at the 14th Caesarea Forum, Caesarea, Israel. http://www.idi.org.il/PublicationsCatalog/Documents/BOOK_5002/%D7%9E%D7%93%D7%95%D7%A2%D7%99%D7%A9%D7%99%D7%95%D7%AA%D7%A8%D7%A2%D7%A0%D7%99%D7%99%D7%9D%D7%91%D7%99%D7%A9%D7%A8%D7%90%D7%9C.pdf (Hebrew). Devicienti, F., & Poggi, A. (2007). Poverty and Social Exclusion: Two Sides of the Same Coin or Dynamically Interrelated Processes?, from http://econpapers.repec.org/paper/ccawplabo/62.htm. EEC. (1985). 85/8/eec: Council decision of 19 December 1984 on specific community action to combat poverty Retrieved 23.03.2011, from http://eur-lex.europa.eu/Notice.do?val=115378:cs&lang=en&list=364792:cs,534756:cs,118174:cs,365456:cs,117734:cs,363966:cs,363561:cs,115378:cs,&pos=8&page=3&nbl=28&pgs=10&hwords=&checktexte=checkbox&visu=#texte. European Commission. (2004). Joint report on social inclusion. Retrieved 04 November, 2009 from http://ec.europa.eu/employment_social/spsi/docs/social_inclusion/final_joint_inclusion_report_2003_en.pdf. Ferro-Luzzi, G., Fluckiger, Y., & Weber, S. (2006). A cluster analysis of multidimensional poverty in Switzerland. Retrieved November 30, 2008 from http://ssrn.com/paper=918744. Morgan, C., Burns, T., Fitzpatrick, R., Pinfold, V., & Priebe, S. (2007). Social exclusion inclusion and mental health: A conceptual and methodological review Retrieved November 30, 2010 from http://www.haps.bham.ac.uk/publichealth/methodology/docs/invitations/JH27_Stefan_Preibe_Final_Report.pdf. National Insurance Institute of Israel. (2010). Poverty and social gaps in 2009, annual report. Retrieved March 1, 2011 from http://www.btl.gov.il/English%20Homepage/Publications/Poverty_Report/Documents/poverty%20report%202009.pdf. The Israel National Council for the Child. (2008). Data from “Children in Israel-2008” Annual. Retrieved October 27, 2009 from http://www.children.org.il/Files/File/leket2008.doc (Hebrew).